Well done to all our gymnasts who competed at Callywith representing either the club or county with some fantastic results (medals, rosettes and t-shirts). Level 6 – Swallows team 3 (Holly Kemp, Stella Laws, Jessica Caves and Zoe Hopkins) came 2nd and team 1 (Olivia Morris, Jasmine Forwood, Morwenna Holbrook and Scarlett Thompson) came 5th. Team 2 (Sophie McCartney, Alaia Wilson, Josie Martin and Zena Jackson) and 4 (Lilia Rowe, Amy Manley and Kaitlyn Standing) all did really well in a tough competition. Level 5 – Swallows team came 4th (Ashleigh Shovel, Katie McCartney, Dana Wheat and Maddison Stanfield), a great result competing against gymnasts from Cornwall and Devon. County level 5 – Cornwall team 1 (including Yuki Cornish) came 2nd, Cornwall team 3 (including Shannon Standing and Charlotte Fidler) came 4th and Cornwall team 4 (including Cara Jackson) came 5th. A fantastic result girls, well done. County level 4 – Cornwall team 1 (including Phoebe Jenkin) came 2nd, Cornwall team 2 (including Dana Littlejohns, Zara Mitchell and Autumn-star Mills) came 3rd. County level 3 – Cornwall team 1 (including Heather Bolton, Maea Morgan and Megan Morris) came 2nd. A great result for all the gymnasts, you did the club proud! Thank you to everyone who made this year’s club competition such a success and fun day. A special thanks to all the coaches for their hard work (prior to the competition and on the day), judges, Kathy for announcing, the head coach for organising the event, parents who were able to help with refreshments, music, raffle etc and to the Deputy Mayor of Helston who was able to present medals in the morning’s competition. Level 6 girls 8 & under, overall champions with the same score were Olivia Morris and Jasmine Forwood, closely followed by Morwenna Holbrook. Well done to all the girls some of whom haven’t undertaken a four piece apparatus competition before. Level 6 girls 9yrs, overall champion Holly Kemp, 2nd Jessica Caves and 3rd Sophie McCartney. All the girls did really well in a very tight contest, keep up the good work. Level 6 girls 11 & under, overall champion Claudia Kitchen, 2nd Isadora Revell and 3rd Kerris Richards. All the girls did really well, overcoming routines they’ve struggled with and did themselves proud. Level 5 girls 10 & under, overall champion was Yuki Cornish, 2nd Charlotte Fiddler and 3rd Ashleigh Shovel. All the girls in this category did extremely well, some of whom hadn’t competed on all four pieces of apparatus at this level before. Level 5 girls 11+, overall champion was Dana Wheat, 2nd Cara Jackson, 3rd Shannon Standing, and 4th Katie McCartney. This was a very close competition between this group who showed their skills brilliantly. Level 4, overall champion was Phoebe Jenkin, 2nd Autumn-star Mills, 3rd Zara Mitchell and 4th Dana Littlejohns. Another close competition but the girls did extremely well practising new skills in a competitive environment. Level 3, overall champion was Heather Bolton and 2nd Megan Morris, both girls have worked very hard and tried out new skills. Boys under 8 – Ashton Watson who had great consistent scores on all six pieces. Boys under 10 – champion Cameron Jenkin, 2nd Aidan Hunkin and 3rd Leandros Papastavros. Boys under 12 – champion Elliot Bullen, 2nd Matt Heaney and 3rd Matt Bolton. Boys under 14 – champion Calum Walklett and 2nd Kai Cornish. Boys under 16 – champion Jake Hubbard. All the boys worked extremely hard learning and improving their skills and routines. 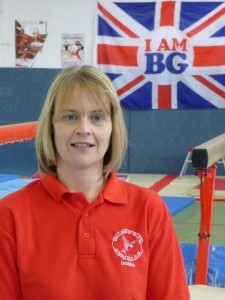 Donna Jenkin (Head Coach) for some 15 years will be leaving the Club in June for a new challenge. The Club are currently in the process of recruiting new coaches to join the team, and hopes that all our members will be understanding at this difficult time. We wish Donna every success for the future. 5 gymnasts from the Swallows of Helston recently took part in the British School’s finals in Stoke On Trent in the Under 14 (mixed) event. 13 year old Maea Morgan, 12 year olds Cameron Wheat, Phoebe Jenkin and Matthew Heaney and 11 year old Shannon Standing all formed a great team against schools from all over the Country, including Northern Ireland. The team compiled an unbeatable Vault tally of 60.90 out of a possible 64.00, and with a set of fantastic floor routines totalling 56.79 were the clear leaders by 5 whole marks after round three. It was clearly nail biting stuff waiting for the final schools to take to the arena in round four! The gymnasts were all of a good standard and some well executed floor routines were being produced. Finally at around 5pm the competition had come to an end and the presentations began. 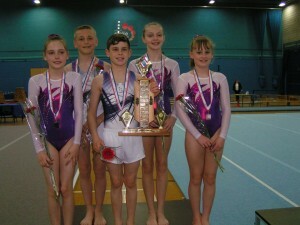 Congratulations to all the gymnasts who have worked well together as a team. Also special thanks as always to the Team coaches – Ainsti Hickman-Jones and Pat Hickman for all her choreography input. The girls floor routines were amazing and so well performed. Thank you to Jaron for travelling from Loughborough Uni to be with the boys and to our wonderful minibus driver Ian from HCC.